Ablestmage.com (via Waxy.org) points us to terrific video of a personal household robot named Newton. "He" was marketed by the company SynPet in 1989 with this VHS promotional video. If you do nothing else, (in the short time we have here on Earth), at least skip ahead to minute 6:20 in the video. The Newton theme song just became the unofficial theme song of the Paleo-Future blog. This is Newton. Technologically advanced, user-friendly, and practical. In future homes, personal robots will be commonplace. 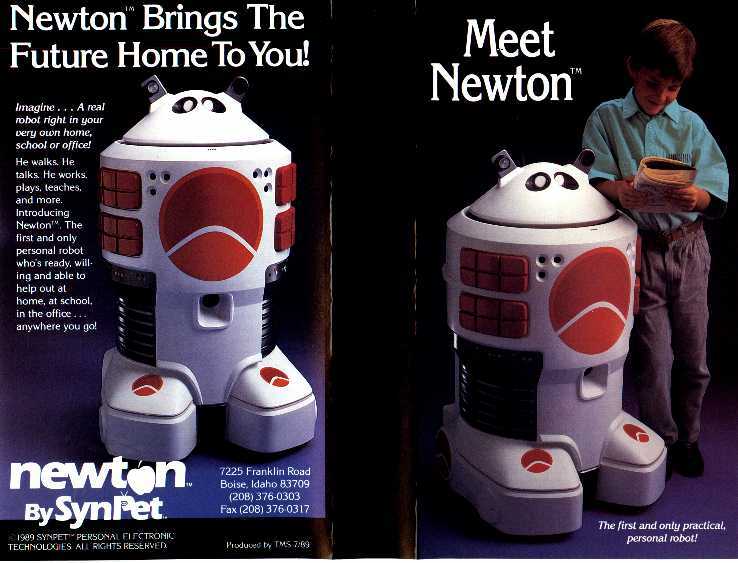 Newton, by SynPet, brings the future home to you. You'll be amazed what he can do! Where future and fun go together! He'll be your friend forever! Whenever! He'll be a part of your family! He's a helping hand through technology! He's a dream come true, bringing the future home to you! He's watching you! The still images above were stolen from Megadroid.com, which has more great photos of the Newton. I've rambled about robot servants on more than a few occasions, but what do you think? Why haven't personal household robots such as these found a market?